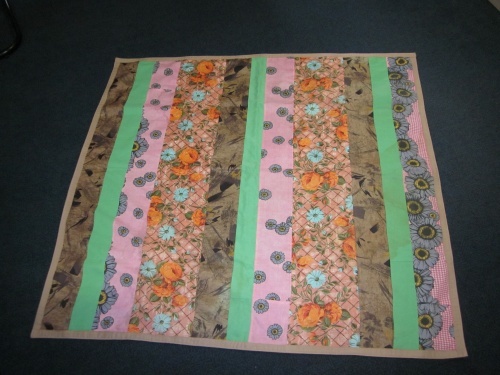 The last Sewing in the Office event for Community Quilts for 2011 is on Monday 28 November 10.30am-2pm Bring along your sewing kit and join in the fun. For further information contact Maree Gebhardt. The 17th Braidwood Quilt Event and Airing of The Quilts will feature over 500 quilts, displayed in the street and different venues in the town. Note that although the free Airing of the Quilts is only held on Saturday, the two-day quilt competition exhibition will be on display Saturday 26 AND Sunday 27 November in the National Theatre, Wallace Street. There will be a $5 entry fee per day to this exhibition. Bungendore Quilters also have their exhibition the same weekend in the Memorial Hall, on Molonglo Street aka the Kings Highway. Theme - Waggas and wool quilts - bring along yours to share! Guest Speaker - Annette Glare, who will discuss Waggas. Feature group - Hunters Hill Quilters. Offline entries close 30 November 2011 and online entries close 1 February 2012. Campbelltown Quilt Show will be held Saturday 12 November & Sunday 13 November. Entry fee is $6. When: Saturday 12 November & Sunday 13 November, 10am -4pm. Where: Campbelltown Civic Hall, corner Queen and Broughton Streets, Campbelltown. Enquiries: Denise Pritchard, phone 4655 5141. The Gerringong Quilt Show will be held 11-13 November. There will be craft for sale and tea and lunches available. Entry is $5. All proceeds go to The Children's Medical Research Institute. When: Friday 11 November and Saturday 12 November 9am - 5pm; Sunday 13 November 9am - 4pm.